Sometimes you just know what you want and you go out and get it. That’s the case with this homeowner who simply called up Walpole Outdoors, had them come out to measure, chose the two different pergola styles you see, and gave them the go ahead. Needless to say, the reputations of Walpole, and ShadeFX as companies committed to total customer satisfaction provided the confidence any homeowner would need to act so quickly. The project is in Oyster Bay, NY and uses two pergolas, each with a canopy, to extend the home’s living space well into the outdoors. 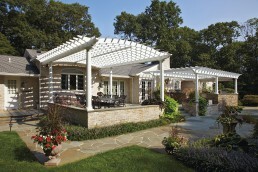 You’ll notice one of the pergolas is arched, and the canopy is tailored to fit that arch perfectly. 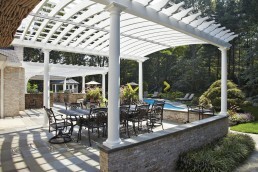 This is a feature we are proud to say is only available from ShadeFX. 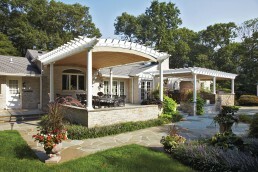 Quality materials are key to a long and maintenance free life for outdoor items. 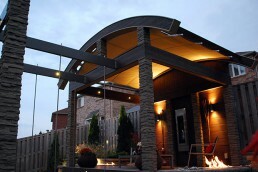 These pergolas are made from Azek which has the look and feel of real wood, with a painted 25-year warranty making for a truly maintenance free finish. 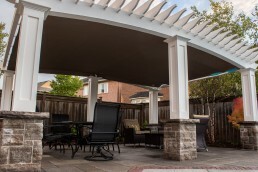 With the addition of the ShadeFX canopies and our 12-year warranty, the homeowner has made an investment that will return many years of dividends. This project in Oyster Bay, NY uses two pergolas, each with a canopy, to extend the home’s living space well into the outdoors. You’ll notice one of the pergolas is arched, and the canopy is tailored to fit that arch perfectly.